for testing purposes or nostalgic pleasures! Its functions have been merged into the AnyGameStarter. into "PermaGames". No support is given anymore on the old BGS games. This thread is being locked and archived for possible reference only. Base Game (CD, DVD, Deluxe, Double Deluxe, Holiday Ed. 2005/06), University, Nightlife, Open for Business, Family Fun, Glamour Life, Pets, Seasons, Celebration, H&M, Bon Voyage, Teen Style, Store Edition, FreeTime, Kitchen & Bath, Ikea, Apartment Life. If you like the BaseGameStarter, you'll love the AnyGameStarter, too! MULTIPLE WINDOWS ACCOUNTS: The BaseGameStarter SHOULD be installed using the SAME account normally used to play the Sims. If you use multiple Windows accounts, read HERE. NON-STANDARD CHARACTERS: If the path to your Documents folder contains non-standard characters (Greek, Cyrillic, Asian alphabets, � � � � � � � � � etc.) don't worry: the BaseGameStarter works for you, too! WIN95/98/ME USERS: After extensive testing, I sadly announce that the BaseGameStarter is NOT COMPATIBLE with your systems. WINDOWS VISTA USERS: The BGS works for you too Please read HERE for detailed info. Creators of Custom CAS Screens: as discovered by Marvine (read HERE), if you create a custom CAS screen with Seasons installed, it will not work properly. You'd better create your custom CAS screens in an "Up2OFB" game (or even a "BaseGame Only" game). Patch for Pets-BodyShop released by Maxis: it solves the backward compatibility problem that affected the first Pets-BS (but the sims exported with the patched BodyShop still contain the clothing meshes). bought from the EA online Shop. There is not fix for this. New Feature: Apartment Life - The BGS is now compatible with the Apartment Life EP and can create the "OnlyAL" and "Up2AL" mini-games. Improvement: Store Edition - The BGS is now compatible with The Sims 2 Store Edition (beta); for anyone curious about this, SE is seen as a Stuff Pack by the game; it doesn't add anything to the game (you have to buy/download stuff online). In all the BGS games, the Store Ed. is always deactivated (if you really need it, use the AnyGameStarter, instead).Therefore, the AGS now gives the ability to include SE in the minigame. Bug Fix: Up to IKEA games - There was a bug, affecting just the Up2Ikea game, that caused it to ignore Teen Style; now the bug is fixed. Improvement: Faster loading and cleaner catalog - When using the "No Maxis content" option, all the pre-made Dorms, Hotel and Apartments have been stripped from the Lot Bin. The Legacy BodyShop (BodyShop with all your EPs excluding Pets and newer EPs). This is valuable if you, for instance, want to test an object you have created to see if it works with a specific EP; or to create a lot compatible with a lower game (without the BaseGameStarter, if you create a lot containing only base-game stuff, it will still require *all* the EPs! But if you create alot using, for instance, the "OnlyOFB" game, it will require *only* OFB, and *not* UNI, NL, FFS, GLS or Pets). In a similar way, the Legacy BodyShop is useful if you have Pets and you want to test if your stuff works fine with *all* the games, and not just Pets. IMPORTANT: When you start a test game, keep at hand the original CD for the chosen game! It is required for the game to run. If you start, for instance, a "Up2NL" game, you will need the Nightlife CD. HINT: when you insert the CD, the autorun will try and run the game, but you'll get an error. You need to prevent the autorun, or at least double-click on the "Start (game)" icon before inserting the CD. Download the attached "BaseGameInstallerPRO_Setup.zip" and unpack it to your desktop; double-click on the installer to start the installation procedure. After admiring the cool graphics of the installer you will be give the chance to choose what test games you want to install. 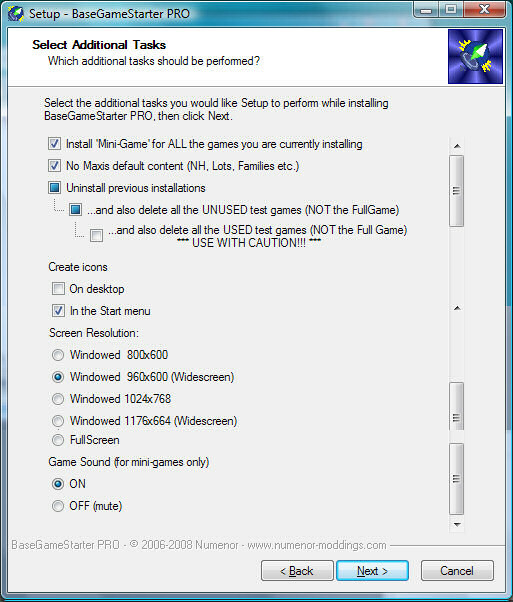 You can either select one of the pre-made configurations from the drop-down menu ("Install BaseGame starter", "Install Legacy BodyShop", "Install all available games" or "Uninstall the BGS and all its components"); or you can manually select the install options that you like from the list (NOTE: the list will show ONLY the options available for the EPs that you have installed; if you don't have Pets, you won't see the "OnlyPETS" and the "Up2PETS" options). Install the Base Game only: this will add an icon to your desktop that, when clicked, will start your game in "pure Base Game" mode, ignoring all the EPs installed. Install the Legacy BodyShop, that includes all the EPs that you own up to Glamour (Pets, Seasons and newer will be excluded). You have the choice whether to run the LegacyBS into a folder of its own (default), or make it run into the "FullGame" folder (i.e. with all your Downloads and SavedSims available). NOTE: The LegacyBS was created mainly to fix a compatibility issue that arose when Pets was first released; this issue was then fixed by Maxis with a game patch. Therefore, the LegacyBS is now useful only to speed up the loading process (it's faster because it ignores all the EPs from Pets on), or to create sims that DON'T contain all the used meshes (unlike the ones created with the latest BodyShop versions). In my opinion, the legacyBS is not that useful, by now, but I'll leave it in the BGS anyway. Install "Only one EP": selecting one or more EP from the list, you will have on your desktop a different icon, that will start the game in "Only 1 EP" mode, ignoring all the EPs installed except the chosen one. For example, if you choose "Only Pets", you will be able to run the game as if you only have the base game and Pets, and no other EPs. Install "Up to one EP": these options will install special icons on your desktop, that will allow to run the game ignoring all the EPs newer then the chosen one. For example, if you choose "Up to NL", your game will use UNI and NL, and will ignore OFB, FFS, GLS, PETS and SSN. Lastly, the option "Uninstall the BGS and all its components" is alternative to any other installation option; its purpose is to completely remove any trace of the BGS from your computer. The Mini-Game neighborhood contains one lot with two sims living in, ready to play. Using this option will let you save 200-250 Mb for each game you install, so it's strongly advised to use it! No Maxis default content: In order to greatly speed up the game loading (especially the first time you run a newly-created mini-game), you can select this option that will prevent the game from creating all the additional lots, families and neighborhoods that come with specific EPs: this prevents the "Creating Pets/Weather/Exotic Destinations" screens, removes the default Maxis lots and families from the bins and will force to create new NPCs, townies and stray pets, with random skins and names. Moreover, this option will stop the intro movie from playing. NOTE: you can still manually create colleges, exotic destinations, downtowns and everything; and you will still find all the clothings, hair styles etc. in the CAS. NOTE2: this option does NOT apply to the Full Game. Uninstall previous installations: normally, the installer can only create new games, adding them to the existing ones. If you want to install a new game and at the same time remove the older ones, then you should select this option. Choosing this "uninstall" option, per se, will NOT delete any game folder: only the icons and the temporary files will be deleted. Delete the unused folders: this option will delete, during the uninstallation, all the games that have NEVER been actually used. This option is very handy to keep low the space used on your hard disk; using this option is safe: only the game folders that have never been used will be deleted (in particular, the game folders where there is NO "groups.cache" file: this file always exists if you have played the game at least once). Please note that "OnlyNL" and "Up2NL" share the same game folder; "OnlyOFB" and "Up2OFB" share the same folder, and so on. Delete also the USED game folders: WARNING! This option will delete all the test game folders, even if you have saved your test game in them! It will delete also the LegacyBS folders, including the Projects and SavedSims that you might have created with the LegacyBS. So, use this option carefully!. NOTE: your "Full Game", i.e. the one you usually play, will NEVER be deleted, even if you select this option. Nevertheless, you are strongly advised to always keep a backup copy of your "Full" game when using the BaseGameStarter. Create icons... On desktop / In Start menu: you can choose one or both options. Screen Resolution...: this option will let you choose the window size when running the mini-games; you can choose between 640x480, 800x600 (default) and 1024x768. The LegacyBS is NOT affected by this setting. Game Sound: you can choose whether your mini-game (all of them) should have the sound ON of OFF; this setting doesn't affect the Full game (it always has the sound ON). When done with the additional tasks, click Next and let the installer do its job; read the messages (if any) and confirm when requested. At the end, you will find the desired icons on your desktop (and/or in your Start menu), that you can use to start the game in the selected "test mode". All the uninstallers usually delete only the files that were created by the installer itself; therefore if you want to completely remove the BaseGameStarter, without leaving any trace in your computer you can't just use the Add/Remove feature in the Control Panel: instead you have to run the installer again, and choose the option "UNINSTALL the BaseGameStarter and all its components" from the drop-down menu. Then proceed, confirming each step without changing the options. The "Full Game" icon: you can always start the normal game by clicking the same icon you have always used; but if you use the new "Full Game" icon, the program will check if the folders are correctly named and if everything is ok for the full game to run. I strongly suggest to run the full game by using the new FullGame icon. The mini-games can be started even if there are opened windows and files: the folders are not renamed any more, and therefore keeping a folder open is not a problem for the BGS. The first time you run a test game, a new environment will be created for your base-game (it may take a couple of minutes): an entire "The Sims 2" folder will be created anew in your documents folder. If you have chosen to install the "Mini Games", the resulting game folder will be much smaller (an average of 200 Mb per game will be saved). If you want to install custom content into the mini-games, you have to manually copy the packages into the mini-game Downloads folder. All the mini-games folders are located in: (Documents)\BaseGameStarter, i.e. outside of the EA Games folder. For your convenience, a shortcut to the BaseGameStart folder is placed in EA Games. The Legacy BodyShop, by default (but you can change this), runs in a folder of its own; therefore, you have to manually move the items you create with the LegacyBS to your "Full" game folder, when you are done. The LegacyBS folder is located at (Documents)\BaseGameStarter\LBS. While installing, you can choose to force the LegacyBS to run into the "FullGame" folder: if you choose this option, you don't have to copy any file into the LegacyBS folder (that does not exist, in this case). Whenever a problem occurs, the first thing to try is to RUN THE INSTALLER AGAIN: this will automatically fix most of the problems. If the problems persist, restart your computer after running the installer. With the new BGS code, it's very unlikely that you will get any error; but in this case, READ THE ERROR MESSAGES: they will explain you what's wrong and what to do. FAQ: "Where is my 'full' game?!? Is it lost??????" - Don't worry, the BaseGameStarter NEVER deletes anything from you Full game folder. Your "full" game is there, but you can't see because the Windows registry is not set correctly. Running the Installer and then restarting the computer will likely solve any problem. You still can't solve your problems? I will help you! Post a description of your problem in this thread and attach your entire (Documents)\BaseGameStarter\AppFiles folder (zipped! ). Please do NOT post the entire BaseGameStarter folder! I only need the AppFiles folder! New Feature: IKEA Home Stuff - The BGS is now compatible with the IKEA Home Stuff SP and can create the "OnlyIKEA" and "Up2IKEA" mini-games. Improvement: [Double] Deluxe - I've finally managed to get access to a Deluxe and a Double Deluxe installations, and therefore I can ensure full compatibility with both Sims2 versions, and also provide assistance if needed. Bugfixes: IKEA, EP detection and Lot installation - Under some circumstances, running a mini-game caused the IKEA stuff to disappear from the Full Game; also, in some cases the EP/SP selector showed EPs actually not installed in the computer; lastly, the installation of lots (by Drag&Drop) didn't work fine when the screen resolution was set to fullscreen. All these bugs have been fixed. Now the BGS is compatible with Kitchen & Bath (and can create the "OnlyKB" and "Up2KB" games). Thanks, as usual, to MaryLou for the K&B icons! New Feature: "No Maxis Default Content" - In order to greatly speed up the game loading (especially the first time you run a newly-created mini-game), you can select this option that will prevent the game from creating all the additional lots, families and neighborhoods that come with specific EPs: no more "Creating Pets/Weather/Exotic Destinations" screens, no more catalogs clogged with the same old lots and families! Moreover, this option will stop the intro movie from playing (even faster loading!). Now the BGS is compatible with Freetime (and can create the "OnlyFT" and "Up2FT" games). New Feature: 64 bit compatibility - The AGS installer will automatically detect 64bit systems, and will install the proper file versions. Bug Fix: Drag&Drop lot installation - Now the lots can be installed by Drag&Drop even if the resolution is set to "Fullscreen"
Improvement: No more "resets" for the Full Game - Every now and then, after using the BGS, the Full Game experienced odd "resets": the custom content check reactivated, several options reset to default etc. Now the configuration file of the Full Game is backupped at every run, so that nothing can possibly modify it unknowingly! Please note that this improvement only works if you use the "Full Game" icon provided by the BGS installer. Now the BGS is compatible with Teen Style Stuff (and can create the "OnlyTSS" and "Up2TSS" games). 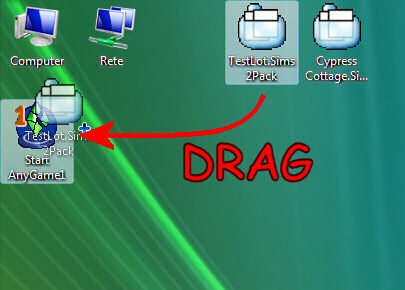 New Feature: Drag&Drop lot installation - You can now install .sims2pack files by simply dragging the sims2pack over the chosen mini-game icon, and the BGS will let you install the sims2pack content into the mini-game, instead of the full game. When the installer opens up, just confirm the installation into the *default* path. This works with both the Clean Installer and the Maxis installer. New Feature: Collections - Now the BGS installer copies all your collections from your full game to each mini-game; this won't harm nor slow down your mini-game because the collections are just small files that contain references to the actual objects: if the mini-game doesn't include the EP needed for some objects to be displayed, the collection will appear empty (e.g. if you open the "Nightlife stuff" collection in a OnlyUNI game, you won't see any object inside). Improvement: Widescreen resolutions - Added two new widescreen resolution for the mini-games (mainly useful for who has a widescreen monitor, but they look fine on a 4:3 monitor too, if you play in window). BugFix: Full Game - Thanks to the users' reports, I've tracked down and fixed a bug that prevented the Full Game to run correctly whenever the user did NOT have all the EP/SP. Reinstalling the BGS will fix your Full Game. New Feature: NoSound - You can now mute all your Mini-Games by selecting the "Sound OFF" option; your full game won't be affected by this setting: it will always have the sound ON. Now the BGS is compatible with Bon Voyage (and can create the "OnlyBV" and "Up2BV" games). New option to completely uninstall the BaseGameStarter and all its components. New option to set the screen resolution of the mini-games. New folder structure: now all the mini-games run in folders located in (Documents)\BaseGameStarter i.e. outside the standard Documents\EA Games. The installer takes care of the older versions, and will automatically move your installed mini-games to the new location. The entire BaseGameStarter thread has been cleaned up: most of the help requests and offered solutions are now outdated and would confuse the users. Only the relevant posts have been kept. The 640x480 screen resolution has been removed: it is not allowed by the game anyway; it has been replaced with the new "Fullscreen" option. Just like before, the censor patch is copied in the mini-games only if it is detected in the full game; the news is that now the unused patches are not copied to the PC at all (so to prevent "young hands" to move them to the downloads folder). complainted about not running the right game. Fixed a bug that affected the Legacy BodyShop (the LBS didn't start correctly). Now the BGS is compatible with the H&M Fashion Stuff pack (and can create the "OnlyHM" and "Up2HM" games). Please note that H&M, just like Celebration, is a weird pack: though it has been released now, after Seasons and Celebration, it is seen by the game as "older" than Pets: that's why I placed H&M between CEL and PETS; in other words, the "Up2HM" game will exclude Pets and Seasons. Fixed in v. 1.5b: fixed a bug that prevented all the "Up2..." games to start whenever the University EP was not found on the system. Now the BGS is compatible with the Celebration Stuff pack (and can create the "OnlyCEL" and "Up2CEL" games). Please note that CEL (Celebration) is a weird pack: though it has been released now, after Seasons, it is seen by the game as "older" than Pets: that's why I placed CEL between GLS and PETS; in other words, the "Up2CEL" game will exclude Pets and Seasons. Some smaller fixes and improvements to the code have been included in this release. Fixed in v. 1.4b: fixed a bug that prevented the "OnlyFFS" mini-game to start. New "Start Full Game" icon: The BGS now creates a new "Start Full Game" icon that is used to start the normal game; the new icon is alternative to the one you have used so far: the difference is that the "Start Full Game" icon performs several checks, to be sure that everything is OK, before starting the game (you can always use the normal Maxis icon to start the game, but in this case, no checks are performed). CEP and Scriptorium support: if the BGS installer detects the CEP and/or the Scriptorium installed in your Full game, then all the relevant files will be copied in each mini-games, so to make the CEP/Scriptorium available in them, too. No-Censor patch: if the BGS installer detects Quaxi's no-censor patch in your Full game, it will install the no-censor patch in each mini-game, choosing the correct version for each mini-game (no more flashing purple sims). Improved the Automatic Recovery routine: now, whenever the BGS can't rename the folders in EA Games, it will ask you to close all the running programs; you will be asked this twice, and then (if the error persists), an unrecoverable error is issued; in this case, you will be given instructions explaining what to do. Legacy BodyShop: Well, after the patch released by Maxis, the LegacyBS is of little use - But, instead of removing it, I've actually improved it: now the LegacyBS can run in the "FullGame" folder (i.e. with all your Downloads and SavedSims available, without having to copy files back and forth). Fixed in v. 1.3b: there was a bug the prevented (only with some XP versions) to correctly create the Config and Downloads folders in the mini-games. For Windows2000 users: restored the compatibility of the BGS with Win2K. Fixed in v. 1.3d: Fixed a bug that prevented the Nightlife mini-game to run, if the user didn't install both "OnlyNL" and "Up2NL" (installing only one of the two options caused a malfunction). Most of the improvements included in this release are not "visible" to the user, but they will help a lot in preventing problems and in solving them! IMPROVED: "Automatic Recovery Routine" - Now it can manage much better the "CHECK" and "FolderX" folders that are created whenever the user makes some mistake. The error messages are much more understandable and will help the users to fix the problems, if a "human" intervention is needed. But there will be less problems to fix, because when you run a game many tests and checks are performed, in order to prevent the games to run in the wrong folder. ADDED: "Repair Installation" Icon (on desktop and/or in Start menu) to start the Recovery procedure without re-running the installer. IMPROVED: Compatibility with older Windows versions (95, 98 and ME) - Hopefully, now the batch files should be backward compatible up to Dos 7.x (please report eventual problems). IMPROVED: "Mini-Game" - Beside the new icon shown in the neighborhood selector, now the Mini-Game is Neighborhood #9. I've done this to be 100% sure that the mini-game won't overwrite an existing game (especially the "Full" game!). Please note that this problem never happened and should have never happened anyway; but when dealing with other people's game, we must take *all* the possible precautions to avoid data loss, right? NOTE - Having renumbered the Mini-Game neighborhood from #001 to #009 might cause a second Mini-Game to appear in some older BaseGameStarter installations. Just delete it if you don't need it. ADDED: "Legacy BodyShop": you can now run the BodyShop as if the Pets EP is not installed, but including *all* the other EPs you have installed. As explained in this thread, BodyShop stuff created with PETS are not fully compatible with pre-Pets games. The "Legacy BodyShop" was created to workaround these problems, letting you create BodyShop stuff fully compatible with Pets and any pre-Pets games. (To fix packages already created with the Pets-BS, read HERE). ADDED: Choice to create icons on the desktop and/or in the Start menu. Some users (including me ) have the need to create several test games, and the desktop may be clogged by the too many icons created. With this option, you can now choose to create the icons in the Start menu, in a folder of your choice. MODIFIED: "Mini-Game". I was sooooo annoyed to create a new neighborhood in every test game, and then some test sims, and put them in a test lot... So, I've included in the installer a sample "Mini-Game Neighborhood", containing only one lot where a couple of sims live. This way, your Mini-Game is immediately playable. FIXED: Missing Glamour items in "Full" game. There was a bug (now fixed) that affected only the Pets games: in particular conditions, when playing the "Full" game after having played a test game, all the Glamour items were missing from the catalog. The new BaseGameStarter not only isn't affected any more by this bug, but the installer will automatically fix your "Full" game, restoring the missing items in the catalog. IMPROVED COMPATIBILITY with older Windows versions: Now the BaseGameStarter is fully compatible with Windows 95, 98 and ME. #26 28th Sep 2007 at 7:39 AM Last edited by mogbog123 : 28th Sep 2007 at 7:48 AM. When you say "NL uninstalled itself", do you mean that you just get an error message while starting the Full game saying "You have uninstalled NL"? 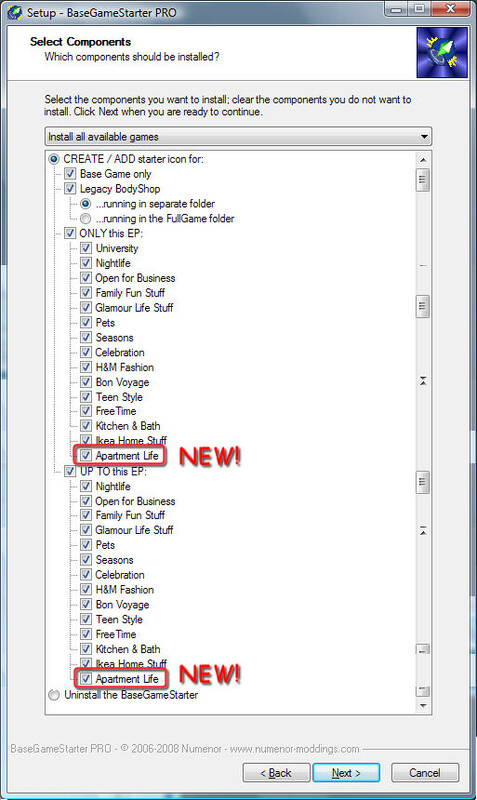 Or the game files are actually missing (I mean the game files located in PROGRAM files\EA Games\The Sims 2 Nightlife)? Will you please zip your folder: (Documents)\BasegameStarter\AppFiles and post it here? To anyone asks for help - The description of the problem is important, but I can't do anything if you don't include your "AppFiles" folder as an attachment to your post. In order to do that, open your Documents folder and then open the BaseGameStarter folder; right-click on the "AppFiles" folder icon and choose any option like "Compress in ZIP", "Create a ZIP", "Add to ZIP" or similar (RAR archives are fine, too). When you have created the zip or RAR, come here to this thread and click the button "Go Advanced", located immediately under the text box (where you write your post). In the new page that opens up, scroll down until you find the button "Manage Attachments". Click the button, and a new small window will open up. Use the topmost "Browse" button to attach the zip or RAR. When the upload is finished, close the attachment window, write your post and click "Submit Reply". Pollyg - Please attach your AppFiles folder, as explained above. (not necessarily in this order). I am having the same problems in both the BGS and your new Any Game Starter, my sims have no bodies, I have selected just the base game to be installed and bodyshop for the BSG, when I try to create a family in CAS the application crashes. Thank you for the much anticipated update! another problem, no matter what nightlife disc (yes i have the main nightlife, its a long story but i dont have main base game) i insert (1 or 2) it always says insert disc number 1...has anybody else had this problem in the past? #37 29th Sep 2007 at 12:38 AM Last edited by simbody872 : 29th Sep 2007 at 3:39 AM. Sigh I have had trouble with BGS since Seasons, I could ONLY run up to seasons, not the full game not seasons only, not base game only, only the up to seasons option. Even after removing BGS and returning my backed up My Documents Sims 2 Folder my game would not function. It took 3 uninstalls to finally remove all registry info before I could get the game to install and run properly. I was excited to see the new version last night and this morning installed them, after making a back up of course. First thing I tried was your any game starter, using OFB Seasons and BV as the new game configuration. The game loads fine, Neighborhood loads fine, but when I entered into the Random house things get weird. First off neither sim looks like the original. Randy has a green shirt on and Rhonda has long hair, The lot will totally load, but both sims' appearance has changed yet again. Randy wearing a Kimono and Rhonda in a long skirt. Within a min or so the game crashes. The first game I open is a BV only game, loads fine, Hood loads fine, house, same issue as before only now Randy's skin tone is invisable and you see the blue background where his arms and neck should be in the family load screen. The lot will load to the 2 standing out front, different clothes again for both sims and Randy is missing the top of his head. My game was working fine before installing both of these. Now I can't even run my full game. OH and how did I end up with Quaxi Censor for NL OFB and Pets? I don't have these in my game and never have had them? But they are in the APPFiles. 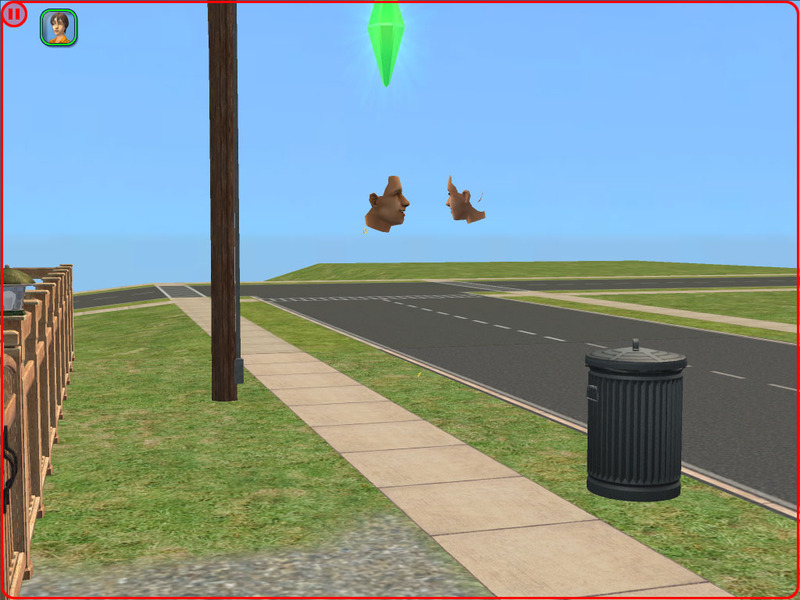 Edit: adding that I have removed my old sims 2 file and replaced it with the back up I made and STILL see the same crash. As a last resort I removed my entire folder and had the game create a new one (after uninstalling BGS and AGS) and even Maxis sims are randomly changing appearance. Here is a shot of Don Lothario, it is a fresh install of pleasantville and this is how I found him upon entering the lot for the first time. I am now experiencing my problems in my full game, actually the same problems has simbody872, game loads fine, but sims have a different appearance, CAS Crashes when trying to create a Sim. Bodyshop loads but when you click to start a project it crashes, so the problems are based around the sims files somehow...looks like I might have to totally reinstall because I don't know where to find the problem or how to fix it., and I really don't want to have to do that. 29th Sep 2007 at 2:18 PM Last edited by Numenor : 29th Sep 2007 at 4:01 PM. #39 29th Sep 2007 at 3:59 PM Last edited by Numenor : 30th Sep 2007 at 1:29 AM. YEEESSSS! I'VE FOUND IT!!!! FINALLY!!! Open the folder where you have installed your game: I mean the PROGRAM folder, not the Documents! If you see a small file named Skins.package, with size 1Kb only, delete it. RENAME the file Skins.disabledpackage to Skins.package. That's all. All the crashes in the CAS, or changing appearance, or entering the lots should immediately stop; the unexpected hair colour or skin tones over your sims should also revert to normal. NOTE: if you HAVE SAVED a lot while the sims were showing unexpected hair or skin colour, I'm not 100% sure that the hair or the skin in that lot will automatically revert to the right tones. So, who was to blame for all this fuss? ME, and only me, I'm sorry. The ability to rename the Skins.package was a discontinued function of the AGS that I forgot to remove from the final release. HOWEVER, this bug only affected the ANYGAMESTARTER: the BaseGameStarter never had this function, and doesn't rename the Skins.package. #40 29th Sep 2007 at 5:18 PM Last edited by simbody872 : 29th Sep 2007 at 5:26 PM. No I tried this fix and it didn't fix my game issues. I still get the same crash when I change appearance. I'm sorry this didn't fix it, now I'm off to spend the rest of my Saturday to uninstall and reinstall my game. Deadlines to keep so loosing another day doesn't work for me. Same for me also, the fix didn't work, CAS still crashes along with Bodyshop. (Debug information (.pdb files) appears to be absent). 0x0001:0x00031f9e C:\Program Files\EA GAMES\The Sims 2 Bon Voyage\CSBin\TS2BodyShop.exe. 0x0001:0x000320ca C:\Program Files\EA GAMES\The Sims 2 Bon Voyage\CSBin\TS2BodyShop.exe. 0x0001:0x00019b44 C:\Program Files\EA GAMES\The Sims 2 Bon Voyage\CSBin\TS2BodyShop.exe. 0x0001:0x0001b4e4 C:\Program Files\EA GAMES\The Sims 2 Bon Voyage\CSBin\TS2BodyShop.exe. 0x0001:0x00050af7 C:\Program Files\EA GAMES\The Sims 2 Bon Voyage\CSBin\TS2BodyShop.exe. 0x0001:0x00018c48 C:\Program Files\EA GAMES\The Sims 2 Bon Voyage\CSBin\TS2BodyShop.exe. 0x0001:0x00001b40 C:\Program Files\EA GAMES\The Sims 2 Bon Voyage\CSBin\TS2BodyShop.exe. 0x0001:0x00122db3 C:\Program Files\EA GAMES\The Sims 2 Bon Voyage\CSBin\TS2BodyShop.exe. 0x0001:0x00122e17 C:\Program Files\EA GAMES\The Sims 2 Bon Voyage\CSBin\TS2BodyShop.exe. 0x0001:0x00011f95 C:\Program Files\EA GAMES\The Sims 2 Bon Voyage\CSBin\TS2BodyShop.exe. 0x0001:0x001219e6 C:\Program Files\EA GAMES\The Sims 2 Bon Voyage\CSBin\TS2BodyShop.exe. 0x0001:0x00012170 C:\Program Files\EA GAMES\The Sims 2 Bon Voyage\CSBin\TS2BodyShop.exe. 0x0001:0x00004274 C:\Program Files\EA GAMES\The Sims 2 Bon Voyage\CSBin\TS2BodyShop.exe. I can upload the rest if you think it may help, I notice it say's (Debug information (.pdb files) appears to be absent), I don't know what that means...do you. I'm also having a crash problem in the game since installing AGS. I noticed this because all of my redheads are now displaying black hair. This is across the board on both cc hair and Maxis hair. The first one I saw, I sent to the mirror to change his appearance and the game crashed. Same with the second one. #44 29th Sep 2007 at 9:56 PM Last edited by Numenor : 30th Sep 2007 at 9:48 AM. GREAT NEWS!!! Read again Post #35! I was talking about Deluxe in another thread: pleas read THIS POST and - if you can - provide the requested information, and I'll modify the BGS to make it "Deluxe-compatible" (and fix your game, too). hmm...i found the simplest way ever to solve it...so you may not have to reasearch my deluxe i posted on the thread you linked to...im gonna complain to maxis to give me a replacement serial code for deluxe and install it again...lol.